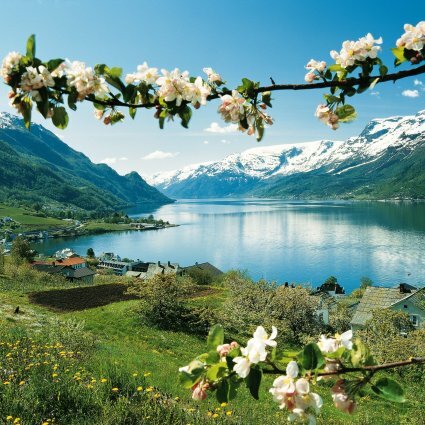 Go on a day trip to the Hardangerfjord, famous for its fruit orchards. The contrast created by green hillsides, orchards in blossom and snow-clad mountains is breathtaking. The tour departs by bus from Voss, taking you to Ulvik and continues by boat from Ulvik to Eidfjord. In Eidfjord you will join a three-hour sightseeing tour, bringing you by coach up the valley of Måbødalen to Fossli with a magnificent view of the mighty Vøringsfossen Waterfall. Vøringsfossen in Måbødalen is Norway’s most famous waterfall, and has a fall of 182 metres, of which 145 metres is a direct drop. On the way back to Eidfjord you will stop for a short visit at Hardangervidda Nature Centre, where you can learn more about the area’s geology, glaciology, archeology, zoology and ornithology. From Eidfjord, you will return taking the boat back to Ulvik and bus to Voss.